The Territory Government, if re-elected next week, will spend as much on a third set of lights for Traeger Park as it will for the rest of the town. Announcing election promises for Central Australia, Chief Minister Paul Henderson said in Alice Springs today it will cost $2.5m to upgrade the lights to broadcasting standard, so that AFL games such as the Indigenous All Stars can be broadcast nation-wide. It will be available in 2014-15. The same amount will be paid to the Town Council for the enhancement of the CBD and community parks. Mr Henderson says this will add to the $5m previously granted and now “earning interest in the bank”. Of that only $1.5m will be available in 2014-15 and the rest in 2015-16. More than $5m will be spent on upgrading schools “across Central Australia” – no details were given which schools. but not the tourist road, the Mereenie Loop, between Alice Springs and King’s Canyon. Mr Henderson said his government had already spent “tens of millions of dollars” on that road and there are now different priorities. Claiming that the promises for Central Australia amounted to about $150m Mr Henderson clearly included a string of further projects in Centralian bush communities, including a $2m creche, a $6.4m “multi purpose youth facility” and $13m for housing at Ntaria, a $4.4m family centre and $13m for housing in Yuendumu, and $7m for upgrading health clinics at Papunya, Titjikala and Docker River. When questioned, Mr Henderson conceded that most of that money will come from Canberra and the time frame was subject to negotiations, lease by lease. He said all that expenditure would flow from an agreement with the Central Land Council for lease payments for land needed for government facilities – something he said the Country Liberals were opposed to. What’s more, the Federal funds would be the result of his negotiations. There is little relevance to differentiate between NT and Federal spending, he said: some 80% of the NT Budget comes from Canberra in any case. Asked what his government, if re-elected, would do to aid the ailing businesses of Alice Springs, Mr Henderson said he would not sack “one single public servant”. Mr Henderson said there would be no further campaign announcements from the ALP about infrastructure spending in The Centre. 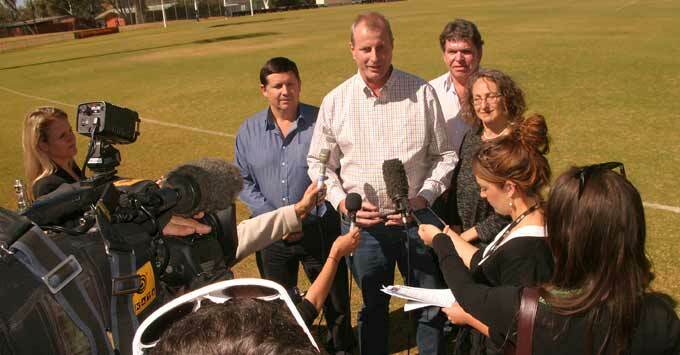 PHOTO: Mr Henderson (centre) during the announcement today. He is flanked by (from left) ALP candidates Adam Findlay (Araluen), Rowan Foley (Greatorex) and Deborah Rock (Braitling). ALP Pork barreling again? What about agriculture as a vehicle for community development, gives people a real job and dignity. The ALP is clearly anti agriculture as seen by declining to participate in Ord stage 2, the decline to assist AAA Co’s meat works proposal in Darwin, the imbalance of regulation versus innovation by the DOR. Well done by ALP, the footy lights will really get a few votes but in the end there may not be any one there to play footy except a few welfare entitlement holders. The same applies to the Palmerston water slide – how many millions wasted there? Was this not a promise that the Labor government made in 03/04 and claimed to have completed in 2004? 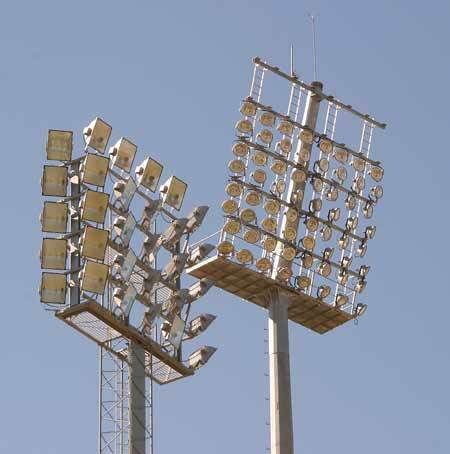 According to the news release (see link below) the new lights were supposedly appropriate for night time AFL broadcasts. Why do we need to spend another $2.5m now, did they stuff it up the first time? I agree with Leigh Childs. Vote Independent. But, and here is the kicker, make sure the Independent will remain independent! Nick Xenophon seems to be a good example, but Windsor, Oakeshott and Wilkie are not, and neither is our own Gerry Wood. While living in Darwin many years ago, when the CLP was in power and I was working as a volunteer for our kids’ local primary school, I remember all the angst of the “devolving power to parents and schools” policy and the closing of “uneconomic” schools right across the Territory. At Nightcliff Primay we had a frantic building program to house the influx of kids ousted from “uneconomic” Rapid Creek Primary School. At no point during the building and at the official opening of the new facilities did our local member, Steve Hatton, admit that all the funds came from the Commonwealth coffers. He always made it sound like his party had supplied the funds. I just wish to make the point to some fanatical correspondents to this site, that ALL political parties play with “the facts”. If you want your vote to count, vote for an Independent. Look how much power Nick Xenophon has and how much he has been able to achieve for his constituents. Yippee, a footy and infrastructure led economic recovery. No mention of the funding to staff, run or maintain these infrastructure promises. The ALP might not sack one single public servant, but will they decentralise departments, senior public servants and staffing generally out of Darwin? Rather than trying to better the ALP with infrastructure and footy funding the CLP would be on a winner by putting their emphasis on facilitating improved educational resources and outcomes for girls. I could paste numerous quotes on the benefits of improving education for girls instead I will leave readers to do there own research. What disgraceful tokenism! No wonder our economy is in so much trouble! I don’t know how anybody from the Alice can stand alongside this bloke and not hang their heads in shame. If I was an Alice Springs Labor Candidate I’d be cringing in a corner somewhere. Paul Henderson obviously has no respect at all for the people of Alice. It’s enough to make me think longingly of a time when we had good old fashion institutions like tar and feathering at our disposal [sigh]. Oh well, guess we are just going to have to be content with a good old fashioned kick in the backside on Election Day. Not long to go now!